One of the most difficult decisions many of us will ever make is putting a loved one in a nursing home or assisted living facility. It is a decision to put the wellbeing of our parents or grandparents in the hands of others, albeit professional caretakers. But when these professionals break that trust in the form of abuse or neglect, they must be brought to justice. Navigating an abuse or neglect claim can be difficult and confusing. Don’t try to do it alone. Call an experienced and compassionate Kansas City Nursing Home Abuse Attorney at Smith Mohlman, LLC. We know the law and can provide skilled legal representation when you need it most. We find it unacceptable that in some of these cases the responsible parties are not held accountable. So it is our belief that every one of our clients has the right to know what they’re up against when dealing with nursing home abuse or neglect. Nursing home abuse is defined as the infliction of physical, sexual, or emotional injury or harm including financial exploitation by any person, firm, or corporation. Nursing home neglect is defined as the failure to provide services to an eligible adult by any person, firm or corporation with a legal or contractual duty to do so, when such failure presents either an imminent danger to the health, safety, or welfare of the client or a substantial probability that death or serious physical harm would result. While sometimes abuse and neglect are not distinctly noticeable, more often than not the victim will show signs of mistreatment. Despite the time, research and care we put into finding the right nursing home for our elderly loved ones, abuse and neglect is not always preventable. Nursing homes have an obligation to their residents to hire personnel who are properly qualified, have the requisite academic degrees for the position for which they are hired, and have no record of abuse or violence. If a nursing home hires its employees without conducting background checks, or if it keeps an employee it knows is not competent, it is the nursing home residents that are put at risk. Therefore, the nursing home can be held responsible if unqualified staff members harm residents. A report from the Center for Disease Control (CDC) shows that the average staff to resident ratio is 1 staff member to every 1.64 residents. When a nursing home fails to employ a reasonable amount of staff members, residents may be neglected because there is no-one to look after them and provide necessary care. In some cases, nursing home employees are not provided with proper training to handle disabled or difficult residents and do not provide the level of care required by law and expected by a family. Nursing homes can be held accountable when inadequate training of their staff leads to the injury of a patient. Nursing homes can be held responsible for any abuse caused by third parties within the residence. This is because they have a duty to provide a safe environment for the residents. For instance, if a resident is injured by another resident or a guest of another resident, the nursing home can be found liable if they failed to provide adequate security to prevent such an incident. Nursing home residents are entitled to autonomy, dignity, and privacy. A nursing home can be held liable if one of its employees violates these fundamental rights. Medications are a part and parcel of old age and nursing home residents can suffer if they aren’t provided the right dosage of medication at the right time. If the resident is injured by a prescription drug error, the physician, administering nurse, pharmacy, or pharmacist can be held accountable. Residents of nursing home facilities are at risk of many infectious germs. Showers, baths, and bathrooms that are not regularly sanitized are high-risk areas where germs can spread between nursing home residents. Also, diseases can stem from a lack of cleanliness. If the staff fails to properly clean nursing home facilities, it increases the risk of infection and other health problems for residents. This can be considered facility negligence. If you suspect an elderly loved one is being abused or neglected by nursing home staff, or if you’re looking for more information on nursing homes, see the list below for the proper authorities to contact. 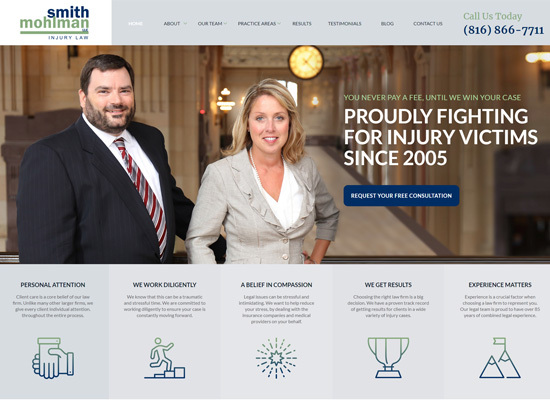 And don’t forget, you can call Smith Mohlman Injury Law for a free consultation. We can help bring peace and justice for your victimized elderly loved ones. The Missouri ombudsman program is a network of volunteers serving residents of nursing homes and residential care facilities to provide advocacy, support, and assistance with any problems or complaints. National Adult Protective Services Association – The APS map is designed to provide easy access to information on reporting suspected abuse nationwide. National Center on Elder Abuse – The NCEA provides the latest information regarding research, training, best practices, news and resources on elder abuse, neglect and exploitation to professionals and the public. We understand how important your loved ones are to you. No one deserves to become a victim of neglect or abuse. To find out if you have a claim for compensation against a nursing facility and to learn more about what our experienced Kansas City Nursing Home Abuse Attorneys can do for you, reach out to us at (816) 866-7711 or contact us using our online form.